Jimmy Donal "Jimbo" Wales (/ˈdoʊnəl ˈweɪlz/; born August 7, 1966) is an American Internet entrepreneur, best known as a co-founder of Wikipedia and Wikia. Wales was born in Huntsville, Alabama, United States. There, he went to Randolph School. He then earned bachelor’s and master’s degrees in finance. In 1996, he and two partners founded Bomis. Bomis was an Internet portal with entertainment and adult content. The company gave money for Nupedia (2000–2003) and, after that, Wikipedia. Wales says that he follows the ideas of Objectivism. He also says that he is a libertarian to some extent, meaning that he thinks people should be allowed to do whatever they want so long as they do not harm others. Horovitz, David (2011-07-01). "Jimmy Wales's benevolent Wikipedia wisdom". The Jerusalem Post. Retrieved 2011-12-12. "Jimmy Wales". Monroe, Florida's County Clerk website (Marriage License Database). Retrieved 2008-05-21.
Who's Who In America: Diamond Edition (60th ed.). Marquis Who's Who. October 12, 2005. ISBN 978-0-8379-69909. ↑ "Wikipedia: 50 languages, 1/2 million articles". Wikimedia Foundation Press Release. Wikimedia Foundation. 2004-04-25. Retrieved 2009-04-10. "The Wikipedia project was founded in January 2001 by Internet entrepreneur Jimmy Wales and philosopher Larry Sanger," quoted from the April 25th, 2004 first-ever press release issued by the Wikimedia Foundation. • "Wikipedia, the free encyclopedia, reaches its 100,000th article". Wikipedia Press Release. Wikipedia. 2003-01-21. Retrieved 2009-04-10. ↑ "Brain scan: The free-knowledge fundamentalist". Technology Quarterly. The Economist. 2008-06-05. Retrieved 2008-06-09. ↑ Bergstein, Brian (March 25, 2007). "Sanger says he co-started Wikipedia". MSNBC. Associated Press. Retrieved March 26, 2007. The nascent Web encyclopedia Citizendium springs from Larry Sanger, a philosophy Ph.D. who counts himself as a co-founder of Wikipedia, the site he now hopes to usurp. The claim does not seem particularly controversial—Sanger has long been cited as a co-founder. Yet the other founder, Jimmy Wales, is not happy about it. ↑ Olson, Parmy (October 18, 2006). "A New Kid On The Wiki Block". Forbes. Archived from the original on 2012-12-06. Retrieved 2009-03-28. ↑ "Jimmy Wales wants Wikipedia to change the world, again". The Jerusalem Post - JPost.com. ↑ 7.0 7.1 "Q & A". q-and-a.org. Retrieved 20 May 2010. ↑ 8.0 8.1 8.2 "Jimmy Wales: Celebrities: Wmagazine.com". wmagazine.com. Retrieved 20 May 2010. ↑ "Business & Technology: He's the "God-King," but you can call him Jimbo". seattletimes.nwsource.com. Retrieved 20 May 2010. ↑ "Jimmy Wales - Wikipedia - New York Times". nytimes.com. Retrieved 20 May 2010. 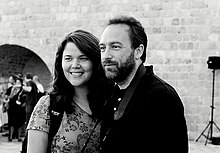 Wikimedia Commons has media related to Jimmy Wales. This page was last changed on 22 April 2019, at 04:49.